Here at Duquesne University, over 30 active fraternities and sororities populate our campus. Each organization encourages lifetime membership, academic excellence, leadership, community service and strong friendships. The Office of Greek Life proudly supports social, sorority and fraternity chapters, fraternal professional organizations and honor societies alike. Alpha Gamma Delta- Alpha Omega chapter won several awards at their national convention held in San Antonio, Texas this summer. Our chapter won the Rose Bowl (top scholarship award), Annulet (top cumulative award), award for member programming. Only one award is given in each category of chapter size! 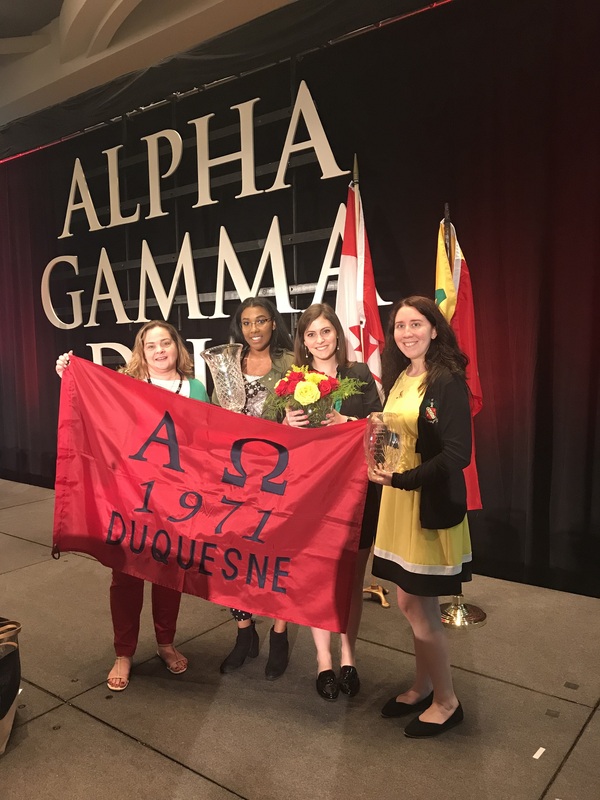 Congratulations to Mikalyla Gilmer and the women of AGD at Duquesne including chapter advisor Cara Group! 2019 GREEK WEEK March 31-April 6, 2019. Crowdfunding was a great success for our organizations! Thank you friends, family and alumni! Overall Greek Week Winners were Delta Chi and Alpha Gamma Delta! Greeks donated over 6000 canned goods to the Greater Pgh FoodBank; donated 157 units of blood to Vitalant; and raised over $7000 for charities.